Welcome to Living Touch Natural Health Spa where we provide personalized spa and massage therapy revitalization. We invite you to relax, restore and invigorate yourself with our skilled professional licensed massage therapists. We are Kona’s number one massage therapy of choice and have been in business for 15 years on Big Island. 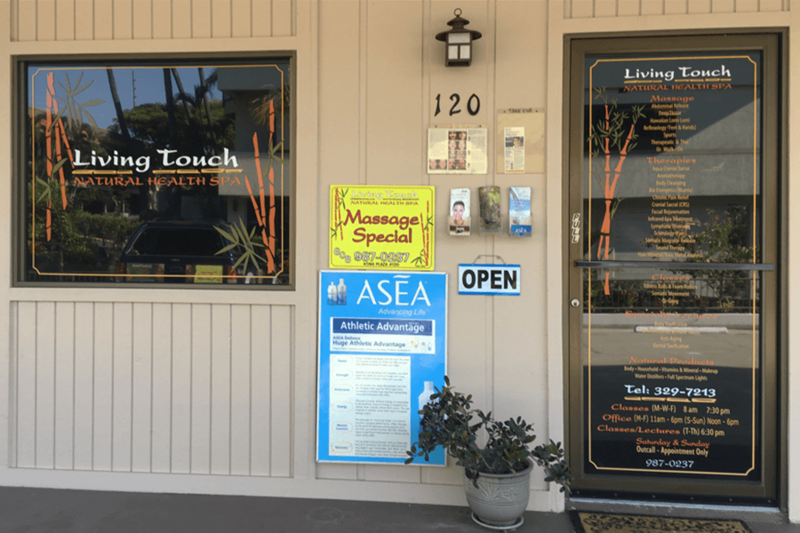 We specialize in 25 healing modalities and are truly dedicated to your overall health and wellness with our touch of Aloha. We strive to educate our clients on how massage therapy is an integral part of the body’s restoration of natural health. Beneficial effects of massage and other alternative practices we provide include lowering life stress, treating muscle aches and muscle-related conditions, restoring flexibility and so much more. With our highly skilled staff, we are proud to continue outstanding services as a member of your healthcare team. Living Touch Natural Health Spa prides itself on dedicated personalized body work that skillfully combines both the relaxation and the therapeutic aspects of massage.